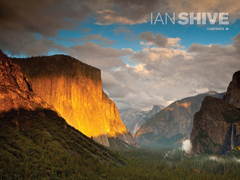 Get ready to embark on adventures of a lifetime when you download the Ian Shive Photography App for the iPad! Now you can accompany the recipient of the 2011 Ansel Adams Award for Conservation Photography – Nature Photographer Ian Shive – today’s leading storyteller of America’s National Parks and author of the best-selling nature books “The National Parks: Our American Landscape” (Vols. I and II) – 24/7, up close and personal, as he documents the “wildest” places on land and under sea. With the tap of a finger, this ginormous, interactive Ian Shive App zooms you in front-row center, PLUS behind-the-scenes, to join this maverick of photography on fantastic journeys through unforgettable landscapes and magical underwater terrain, including U.S. National Parks and other natural earthly treasures. You’ll discover how Ian is inspired, what goes into making his photographs worthy of publication over and over, and learn how to make your own photos extraordinary including a complete check list of suggested gear, Pro step-by-step tips and techniques, countless personal photo essays, anecdotes, and a rare peek into the camera bag of Ian Shive himself. 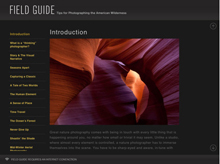 Cutting-edge and practical, a highlighted feature of the Ian Shive App is Ian’s unprecedented “Field Guide to Photographing the American Wilderness.” The digital field guide is easy-to-read format, invaluable resource of insightful, highly-applicable expertise, gathered from Ian’s Shive vast experience working under a variety of conditions from the typical to the extreme. 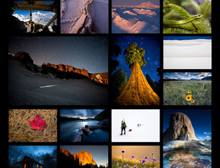 Best of all, you’ll enjoy too-many-to-list in detail, full-color Ian Shive photographs AND videos that will take your breath away, including dozens of mesmerizing, never-before-seen images from Ian’s best-selling National Parks book. You’ve seen his images on the pages of your favorite magazines; now go behind the lens to see the complete story and the fascinating outtakes that may not have made it to print. The App also features Ian’s Photo Journal with lots of planned live dispatches from the field; lengthy in-the-field videos, and tons of in-depth stories. Another outstanding feature of this trend-setting photographer’s App are Extensive updates, expanded sections and new developments are already set in motion for the future to which you will receive exclusive access to, unavailable anywhere else. So grab your camera and prepare yourself for what was designed to be the most exciting and fun photography adventure you can experience on your iPad! • Field Guide to Photographing the American Wilderness. Ian’s first “how-to” book that provides technicals details and thought-processes Ian’s most popular photos including many of his well-known National Park photos. This section will constantly grow and update as Ian continues shooting and adding new work. • Photo Journal, live photo dispatches from the field.